Joel Edmundson is one of the players trying to help the Blues establish a more physical presence. Among the changes the St. Louis Blues attempted to make to their hockey team this offseason was a clear goal to get tougher physically, a unique aspiration given the downward trend of enforcers in the game. The team added some bigger and burlier players to the roster in Troy Brouwer (6-foot-3, 213 pounds), Kyle Brodziak (6-foot-2, 212 pounds) and rookie Joel Edmundson (6-foot-4, 207). The goal is to have those players establish a physical presence on the ice in order to give the Blues' smaller, more talented forwards space to work. The Blues currently rank sixth in the NHL in hits (168) and are fifth in the NHL in fighting majors (three). 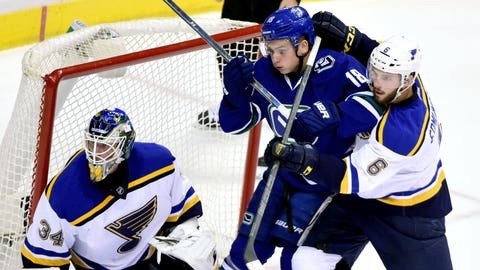 It is difficult to fully measure a team's physical impact, however, but the Blues likely want to keep those numbers trending upwards as they sit in second place in the Central Division through the first seven games of the season.